Fortinet incorporates ICSA-certified Unified Threat Management technologies in a single ASIC-based appliance named FortiGate that is easy to install and manage. 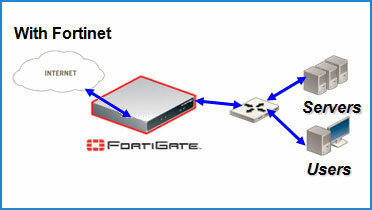 FortiGates are available in a complete line of security appliances which include anti-virus, stateful firewall, IPSec and SSL VPN, intrusion prevention, anti-spam and Web content filtering. Models scale from small office/home office to enterprise and managed service providers. The combination of models and features offer a compelling total cost of ownership. And, you don’t have to replace your existing solutions. With Fortinet, you can select the technologies that compliment your existing solutions. Fortinet's FortiMail is a secure messaging platform that provides optimum configuration flexibility with enterprise-class anti-spam and anti-virus features to secure mission critical email applications. FortiMail's anti-virus technology extends full content inspection capabilities to detect the most advanced email threats. 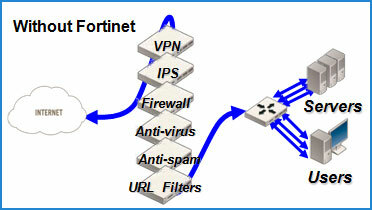 FortiClient provides the latest security technology without requiring complex user involvement. VPN policies can be centrally managed and pushed out to each client to simplify user setup and connectivity. Personal firewall and anti-virus components provide application monitoring, zoning, and registry monitoring to detect known and unknown threats. FortiClient protects mobile users when they can’t be protected by corporate security resources.